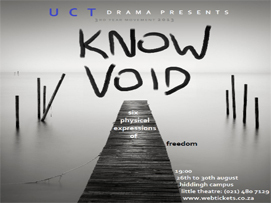 UCT Drama Department presents KNOW VOID, six physical expressions of freedom, choreographed and performed by the UCT 3rd year Theatre-makers and Performers. The movement pieces explore the themes of love, liberation, otherness, sexuality and the essence of human existence in six individually crafted artworks of dance. Overseen by two of Cape Town’s leading choreographers, Fiona du Plooy and Jacki Job, each piece strikes a balance between dance and storytelling, exploring the body’s ability to move and be moved. Guaranteed to extend your perception of physicality. Thought-provoking, poignant, and promising to leave you breathless and craving more, this is an evening you do not want to miss.